Move, get strong, stay mobile, and your body will not only perform better, but you will experience fewer aches and pains. The body needs and begs for movement and robust muscle and bone to support it. With the sedentary nature of most professions these days, our bodies are left wanting. This results in injuries, aches, pains and a reduced ability to participate in activities of daily living and the things that bring you joy. A reduced ability to live the way you want, and should. Thrive Physio Plus has been developed with a simple philosophy in mind: to empower people to function at their maximum potential by utilising high quality, ethical and evidence based Physiotherapy and supervised exercise for all. We care for people and our drive for outcome-based healthcare keeps us motivated and hungry to assist every client in reaching their goal. Whether an ache or pain, a return to sport, rehabilitation from surgery, or simply helping you to get active, we have the skills and the passion to get the most important asset you possess…your body, thriving. 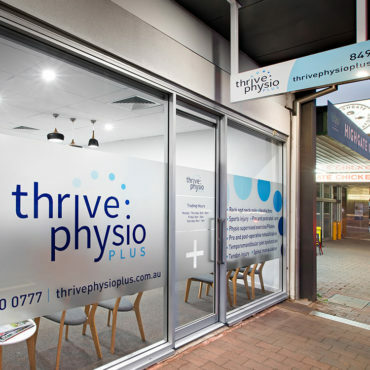 Welcome to Thrive Physio Plus.